I got hold of one of both "Lord of Battles" rondels last year. For the price, I was pleasantly surprised: well put together, sturdy, historically plausible (from some distance). Both are sturdy, perfect candidates for upgrades. It took me 2 minutes to disassemble - good surprise as nothing is glued. A few pass on the "peened" tang top and I was able to unscrew everything. Nut and top rondel are simply screwed on. Wood grip and brackets are loose, which could not be better to tweak and play around with. 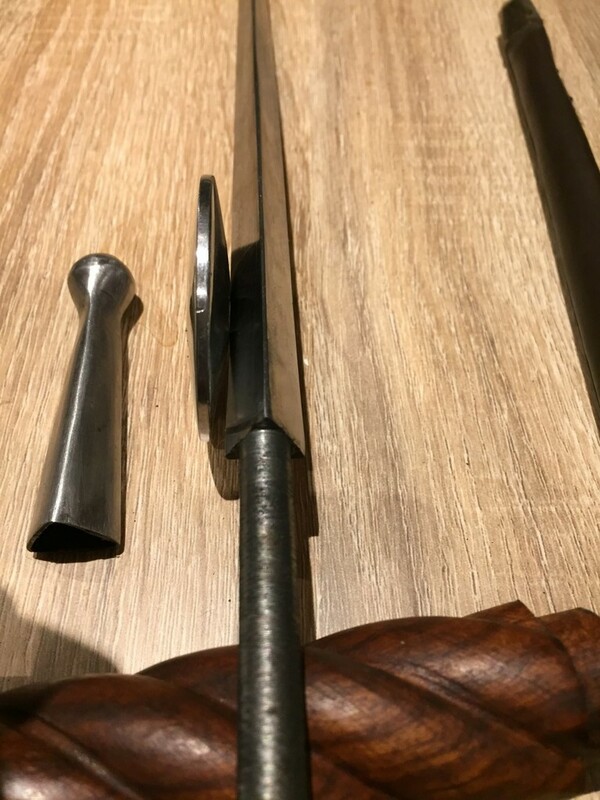 So for 57$, I have a dagger kit including a nice roped wooden grip, 2 grip brackets, a very sturdy triangular blade (with a beefy threaded tang), 2 nicely shaped rondels (the discs tapper towards the edge), a steel scabbard shape I can work with. Scabbard and bayonnet style loop suspension had a one way trip to the bin. Most of the hard work is done, everything is pre-assembled and ready for tweaks...so pretty happy with a purchase I was not fully convinced about. This will be an excuse to do an rondel scabbard, always wanted to make one of those, but I could not resist and started messing about with the discs and wooden grip. I'll make the grip profile more subtle, file work the grip brackets, peen the all thing. I've started working on the discs - black and decker power file...35 minutes so far. I'll refine with dremel and file work. Oooh! Exciting project! I've wondered about those as project pieces, so this will be fun to watch. I'm sure you have Sean! I'll try not to go overboard and finish within the next 2 month instead of embarking on a 2 to 4 years epic project . I keep on screwing up my shape brazing on my Durer project and I needed a break. Mine's ordered! I see some silver wire wrap on a grip and some file-worked rondels in my future. Sheath.....not too sure yet....may keep the bottom chape and build around it. Thx Mark, looking forward to see what you'll make of it too. 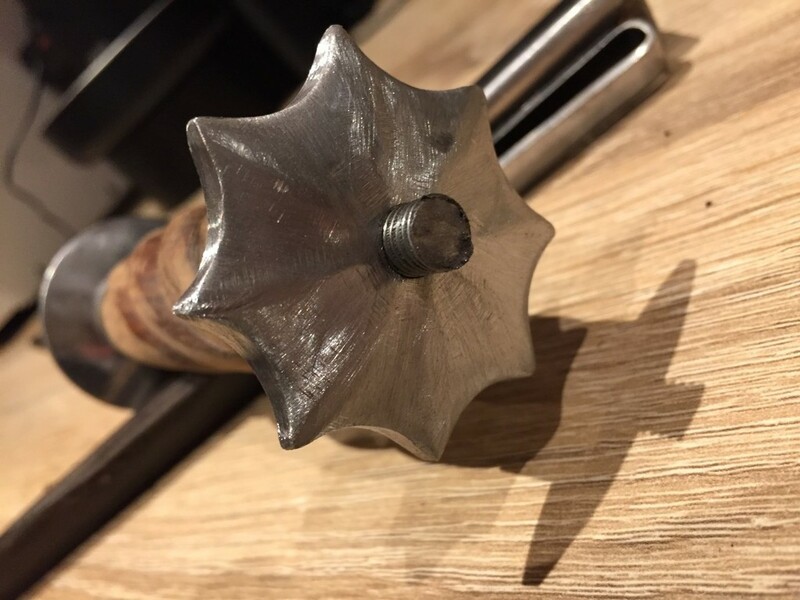 These rondels are easy to work with, especially the top one that you can screw on the tang and clamp on a vice and file away. Yeah keeping the shape is a good idea, not hard to make more appealing with some filling too. Should look good on a double layered veg tan scabbard. Thanks much for the lead. 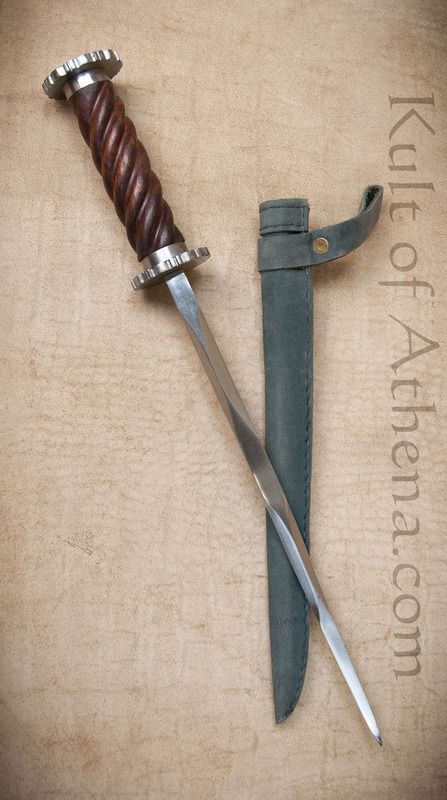 Had started a rondel project several months ago and was considering butchering an old bayonet for the blade.